Pope Francis reflects on two types of unity in his homily during Mass on Thursday morning at Casa Santa Marta. One he calls “true” unity; and the other, “false” unity. 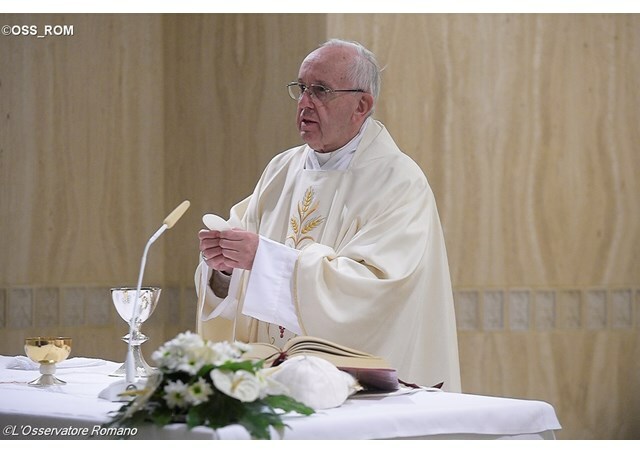 The first reading from Acts 23:6-11 and the Gospel from John 17:20-26 demonstrate two styles of unity, Pope Francis said during his homily at Mass at Casa Santa Marta on Thursday morning. Pope Francis sees a false unity binding Paul’s accusers together. It is false because it leads to division he said. The Sadducees and Pharisees are at first united in their accusation against Paul. But Paul lays bare the “stone that divides” them, observing that he was on trial because of his “hope in the resurrection of the dead”. exploitation of the people [which] is also contempt for the people because it converts them into an anonymous mob. It is an element which often repeats itself. Let’s think about this. On Palm Sunday everyone acclaims him: ‘Blessed are you, who comes in the name of the Lord.’ The Friday after, the same people cry out ‘Crucify him.’ What happened? They brainwashed them, and they changed everything. They became an anonymous mob which destroys. when two or three begin to criticize another and begin to talk behind the person’s back… They create a false unity to condemn. They feel safe and condemn. They condemn mentally, then they act it out; then they end in accusing each other because they are divided. In this way gossip is a behavior that kills because it destroys people, it destroys their reputation. men and women who are united and who always seek to progress along the path of unity—not a false unity, which has no substance, which only serves to get ahead and condemn people, and promotes interests which are not ours: the interests of the prince of this world, which is destruction. May the Lord give us the grace of walking always along the path of true unity.